As expected, Bernie Sanders added his name to the growing 2020 Democratic presidential field by officially launching his campaign on Tuesday, continuing the streak of there being at least one retread candidate in every presidential election cycle in the modern primary era. The independent U.S. Senator will not only run against a more competitive (and congested) field than what he faced during his impressive 2016 bid, but also face much greater scrutiny. Some Hillary Clinton supporters still blame Sanders in part for her failure to win the White House and charges of the senator being tone deaf when it comes to issues of gender and race still percolate on the left. Senator Sanders also continues to be criticized for joining the Democratic field when he is in fact an independent lawmaker. That argument, however, may hold less water in 2020 as the party’s base has moved even further to the brand of Democratic-socialism for which Sanders advocated in the last presidential cycle. But unless he wins the Democratic nomination, it will be difficult for Sanders to best his 2016 effort which is in the record books of the best showing among the handful of presidential candidates to seek a major party nomination from Vermont in state history. It took nearly 70 years since Vermont was granted statehood to produce its first presidential candidate. At the 1860 Republican National Convention, U.S. Senator Jacob Collamer received 10 favorite-son votes on the first ballot – all from Green Mountain State delegates. That was good for eighth place among the 12 individuals who received votes on the first ballot. Collamer, who had previously served three terms in the U.S. House as a Whig from 1843 to 1849, was finishing his first of two terms in the upper legislative chamber. He had also served in the Vermont House of Representatives in the 1820s and was a judge of the Superior Court from 1833-1842 and 1850-1854 before his election to the U.S. Senate. After the first round of balloting, Collamer withdrew his name and the Vermont delegation unanimously voted for Abraham Lincoln on the remaining two ballots. 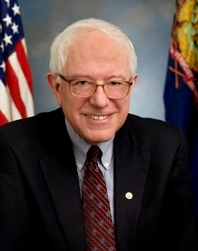 Twenty years later, Vermont’s most successful presidential candidate in history prior to Sanders made his first of two bids for the Republican nomination. George Edmunds, a former Vermont House Speaker and member of the Vermont Senate, was in his third term in the U.S. Senate when his name was placed into nomination at the 1880 Republican National Convention. Edmunds received 34 votes on the first ballot – good for fourth place behind former President Ulysses S. Grant, Maine U.S. Senator and former U.S. House Speaker John Blaine, and Treasury Secretary John Sherman. The nomination was seconded by delegate F.D. Sanford of Massachusetts. On the first ballot, Edmunds received 20 votes from Massachusetts, all 10 votes from the Vermont delegation, two from Connecticut, and one each from Ohio and Tennessee. Edmunds continued to receive more than 30 votes until the 29th ballot when his Massachusetts supporters shifted to Sherman, dropping the Vermont U.S. Senator’s tally down to a dozen delegates. Ohio U.S. Representative James Garfield eventually won on the 36th ballot. In 1884, Edmunds was nominated again, this time by Massachusetts delegate J.D. Long and seconded by writer George William Curtis of New York. Edmunds saw his support nearly triple from four years prior to 93 votes on the first ballot – good for third place behind James Blaine and President Chester Arthur. The Vermont U.S. Senator won all eight votes from the Rhode Island and Vermont delegations plus 25 votes from Massachusetts, 12 from New York, seven from Michigan, six each from Minnesota, Missouri, New Jersey, and Wisconsin, four from New Hampshire, two from Arkansas, and one each from Indiana, Pennsylvania, and the Montana Territory. Edmunds lost support on each of the next three rounds with Blaine winning the nomination on the 4th ballot. Vermont had another presidential candidate – of sorts – during the Election of 1900. Montpelier-born and Norwich-educated George Dewey was a Spanish-American War hero who famously destroyed the Spanish fleet in Manila Bay two years prior. Dewey’s campaign lasted only until May when he endorsed President William McKinley. While not a presidential candidate, a Vermonter did receive a vote at the chaotic 1924 Democratic national convention. Burlington delegate J. Holmes Jackson, the 1922 Democratic gubernatorial nominee who lost by nearly 50 points to Redfield Proctor, received a single vote on the 39th ballot at a convention that would take 103 ballots to nominate West Virginia’s John Davis. Another 80 years would pass before Vermont produced a bona fide presidential candidate. Former six-term Governor Howard Dean was one of several Democratic hopefuls vying to take on President George W. Bush in the Election of 2004. Dean entered the race in 2002 and was a top-tier candidate the summer before the Iowa caucuses, but placed a disappointing third in the Hawkeye State and lost to John Kerry by double-digits in neighboring New Hampshire to mark the beginning of the end of his bid. Dean remained in the race through the Wisconsin primary on February 17th where he again placed third garnering less than half the support of Kerry. The former Vermont Governor officially exited the race the next day, although he would still win his home state’s primary two weeks later on Super Tuesday to mark the lone state he would carry in the 2004 campaign. Note: Other minor party candidates have run for president from Vermont, such as Libertarian nominee Roger MacBride in 1976 who appeared on the ballot in 32 states. In 2016, Sanders was the initial delegate winner in 22 states conducting contests from February through June: New Hampshire, Colorado, Minnesota, Oklahoma, Vermont, Kansas, Maine, Michigan, Nebraska, Alaska, Hawaii, Idaho, Utah, Washington, Wisconsin, Wyoming, Rhode Island, Indiana, West Virginia, Oregon, Montana, and North Dakota. Sanders’ challenge in besting that mark is that he doesn’t have as much possession of the social-democratic ideological space in the field. He also faces the geographic challenge of running against several competitors from his Northeast region who have either already launched their campaign (Cory Booker of New Jersey, Elizabeth Warren of Massachusetts, John Delaney of Maryland) or an exploratory committee (Kirsten Gillibrand of New York). Previous: Is Virginia’s Democratic Electoral Streak in Jeopardy? 2 Comments on "Bernie Sanders and a Brief History of Vermont Presidential Candidates"
1. Not only is Sanders a “retread” contender, but he has also a MAYORAL background (Burlington, in the early and middle 1980s), along with ex- or incumbent mayor of South Bend, IN; Newark, NJ; and San Antonio, TX – and may yet be joined by others. 2. While J H Jackson was receiving his single vote at the infamous ’24 D convention, another Vermonter – by birth – garnered many more convention votes, and went on to win the election by about 25% (and 37%), carrying all venues except for Wisconsin, Oklahoma, and the 11 ex-confederate states. 3. “…continues to be criticized for joining the DEMOCRATIC field when he is in fact an independent (albeit leftish) lawmaker”. Meanwhile…a lifelong Democrat has been (at least until recently) harshly critised for NOT JOINING the party field, and maneuvering (threatening?) to go straight to the ‘independent’ route – thereby not willing to subject his (past public and personal) records and platforms to a major party for even more detailed scrutiny, and perhaps all too willing to be an unplanned alleged spoiler, a la Governor Gary Johnson and Dr Jill Stein (’16), Ralph Nader (’00), H Ross Perot (both ’92 and ’96), and George C Wallace (’68).